I meant to return home to California from Korea via a layover in Hawai’i, which lies at the heart of the vast Pacific Ocean separating East Asian from North America’s west coast. The fares looked cheap on Jin Air, but when I go to check out, I see they don’t include taxes and all the extras. So I now turn to an old friend, Skyscanner, in search of alternate routes. A flight through China — specifically, Chengdu — initiates the resulting list of options as the most economical choice. At $350, it’s affordable for my now-fluctuating income, but there’s one hindrance: I have to first fly opposite of the direction I want to go in. In terms of real, cold time, it’s not that much of a difference, but to my homeward-bound mind, it casts a colossal imposition. If I choose a direct flight or go through Hawai’i, how much closer home will be! The route this ticket offers feels to me an immovable buffer between me and my California; if I buy it, landing at LAX seems like a far away dream. Maybe it’s because it puts more distance between my destination and I. But my destination is not any destination — it’s my security after a trip of feeling unsettled and disoriented. Although I love South Korea and kind-of-enjoyed Japan, I’m going through career transformations and the shedding of an inner layer of emotional baggage that kept me in precarious relationship situations. It’s taken a lot out of me, and I just want to go home. California represents to me more than just a geographical shift. The deeper layer of my move is what tugs me so strongly eastward across the Pacific: since early July, I’ve felt so ungrounded - financially, emotionally, professionally, even physically with not exercising as much as I like to. That plane landing at LAX signifies an internally landing, a personal grounding, after several months of hovering above land, disoriented and dazed. It’s only a matter of a day’s difference — the trip to China is an overnighter that necessitates moving backwards in time — but in my mind, whole lives could come and go in that one day. I want the comfort of my land in a way I have never experienced while abroad. But in the end, my concern for my wallet has the final say. Pragmatism defeats emotions, at least this time. I buy the ticket. As I research a layover in China, one problem turns into multiple: China doesn’t support Google, which is essentially my life therapist, guru, and guide. Chinese stores don’t support credit card purchases, and I’m relying on my no-foreign-transaction-fees Sapphire. I’ll need to book a hotel in China, and figure out how to get there from the airport. My camera on my phone is broken, and almost all Chinese transactions - public transportation tickets, food, umbrellas - occur by scanning a QR code through the Chinese-famous app WeChat. I can’t download the app that will let me reserve and pay for taxi, DiDi, because of an SMS issue. Didi is so integral to taking a taxi in China that if I need one, I won’t even be able to pay for one in yen, the national currency. I know that all these things are navigable while I still have the internet in South Korea, but it all seems to overwhelming. My emotional state is thrown back in time to my first slumber parties as a little girl: I just want to go home. I regret buying this ticket back. But, if there’s any one prominent lesson I’ve learned from this 2018 project, it’s this: one step at a time. It’s the only way to move forward when things break down, and I know this well by now. I will myself to enter my trip dates on the Couchsurfing app, hoping to find a non-sleazy local to help me survive this one day. Luyao, who goes by Echo, is a freshly graduated Chengdu native, and she reaches out to me a few days after my post. From beginning to end, she is the force that greases what feels like the massive, creaky, rusty wheel of my one-earth-rotation in China. We plan to go to the panda breeding center to see the gentle giants — Chengdu is the world capital of pandas — and then explore downtown until I need to leave for the airport. On September 8th, the final day of my six weeks in Korea, I change my last won to yen. It totals $20. I board my flight from Incheon. After midnight on September 9th, I land in the land of pandas. The Holiday Inn Express is supposed to pick me up under the giant gold panda in the parking lot. I wait at the spot. My first impression of this city, snug in the center of the country, is that it reminds me more of India and less of East Asia. Something about the heady aroma, and the way the taxi drivers bustle and heckle around me. No one shows up and, knowing my cell phone is as useless as a brick, I feel the surge of panic in my chest. After 20 minutes, I start walking around the parking lot. A Chinese man asks me where I’m going and uses his cell phone to call the number I have. He is my second champion, following Echo and to be again followed by Echo the next day. The Holiday Inn shuttle appears from the steamy mists of the city and takes me to the hotel. The WiFi at the hotel is too weak to let anything other than text messages reach beyond its gates. Goodbye, Internet. In the morning, I wake to a plundering storm. The pandas won’t be outside, Echo texts. She sends me a photo through WhatsApp with a map of change-in-plan directions, but China doesn’t allow photo sharing on the platform. I wonder if I should just stay in the hotel until I leave for the airport. But Echo takes the time to text out all the directions, and cites a specific bus stop to meet at. I text her what I’m wearing and she texts me what she’s wearing, because I won’t have texting from then on. How did people find each other in the millenniums before phones? It takes all of me to figure out how to get there, but I do. It’s pouring. I buy an umbrella with the cash I was reserving for the panda center and wait 20 minutes. In that expanse of time, I’m convinced that there has been some miscommunication, that I’m in the wrong place. Echo, though, eventually shows up without additional prompting, unlike the Holiday Inn Express. I recognize her from her picture before I register her outfit colours. In the moment we meet, everything changes. I’m in a different Chengdu from that moment on; one accessed by the familiarity of a local. My feet are puddle-soaked with water, but my spirit is renewed: I’m in safe hands! Walking around Tianfu Square, Echo points out the statue of Mao Zedong. We pass People’s Park, and she indicates all the different types of street food along the way. Chengdu, situated in the belly of China, is a crossroads for many oft-overlooked Chinese cultures, Tibetan and Uyghur (prounounced Wee-ger) prominent among them. We buy crispy Uyghur bread, still oven-warm, from a stall and scarf it down with hot tea. I try fried sweet balls, five to a stick, and Echo shows me a dessert whose creation process sounds like a procession of gongs. She’s found a vegetarian buffet offering all the local foods of the Sichuan province, and it’s my dream. I load up on rice noodles, soups, Asian pears, and a milky rice drink. Over lunch, Echo tells me she’s never left China aside from a recent trip to Tanzania for her internship. She loves Tanzania and longs to travel again. Her purity of heart illuminates her speech, giving her words extra dimension. Pandas are everywhere, but these ones are non-sentient: in the form of souvenir blankets, pens, backpacks, hats, socks, notebooks, umbrellas, they permeate the streets. We stop at the famous Panda Post, and I indulge in bookmarks, postcards, and a ring. Turning up Narrow Alley and returning down Wide Alley, we pass chili shops (Chengdu is famous for its spicy Sichuan cuisine, the emblem of which is the famous hot pot), tea gardens, hotels, Sichuan opera houses, and endless panda stores. 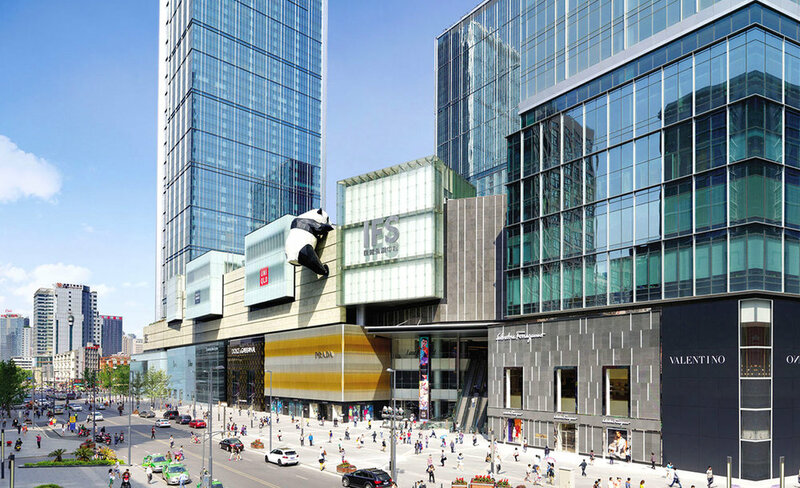 We go to the largest panda statue: a huge giant ascending the top of a mall. The roof affords a frontal view of its friendly face, but its street-view bum is all the more endearing, reminding me of a pandified Pooh Bear with his backside sticking out of a honey pot. My time runs out fast. As a final Chengdu rite of passage, we buy bubble teas at one of the better stalls lining the road. I buy the tea for her and she buys me a train ticket with her QR code, so elusive to my camera-deprived phone. True to form, Echo writes down, step by step, the directions I need to take to reach the airport. China was never meant to be included in this project of mine. All countries, all places, even the same place revisited, offer a new lens with which to understand the world, the self, and others, but usually not in a way that pushes me the way this has. Here, I feel in a distant world, so far removed from the rest of world by a bubble that cannot be punctured by the technological leanings that the rest of the world rely on. And yet, when I encounter a generous local like Echo, I forget what I’m missing and settle in the place’s beingness. She has given this city a warmth to me, and even as the rain poured down on us, the hostility it posed while I was alone gave way the cosiness of a misty blanket enveloping the city. My thoughts expand to the entirety of the planet: would this Earth feel foreign without the comfort of the company we keep? Or would the solitude be liberating? As much as I love being alone, as much as I love the land, it’s only the former that gives this planet I’m passing through a homeliness. What is a place without the presence of other welcoming life, if only a tree? As I take the train, I realize that Echo and I never took a picture together. She texts me her same realization as I board the plane that will take me through the Pacific skies. Chengdu, through Echo, has welcomed me with open arms, and I didn’t even miss Google. The giant pandas I missed — the living ones, not ones scaling buildings — call me back, and now a selfie adds an even greater pull. It’s a rain check.